If you want to discover the South, then Savannah, Georgia, is a fantastic place for you! As you stroll past historic houses, admire horse-drawn carriages, and protect yourself from the sun under trees draped in Spanish moss, you will live a unique and exceptional experience. There are many things to do in Savannah, but don’t hesitate to leave the city limits! Day trips from Savannah to Charleston are easy and so much fun. Within a couple of hours of driving, you can explore another great coastal city and immerse yourself in an elegant, Southern way of living. Read on to find out more about day trips from Savannah to Charleston and start planning yours today! Organizing a day trip from Savannah to Charleston is very easy. Less than two hours apart, the two cities are practically neighbors! Traveling by car is your best option. Not only is it a nice drive, but having a car also gives you more freedom. You can leave whenever you want and return at your convenience. The itinerary is simple: from Savannah, get on US 17 North from N. Fahm Street. Follow US 17 until I-95, then get back onto US 17 North until you reach Charleston. Tip: Parking in Charleston can be difficult, and the narrow roads might be confusing for those who are no used to it. Find a good parking lot so you don’t have to worry about towing! If you do not wish to rent a car, you can get a taxi to drive you to Charleston. Fees may vary depending on traffic, but you are looking at roughly $200 one way. There is also a Savannah airport shuttle available that travels between the two cities for approximately $150. Keep in mind that Charleston airport is not located downtown, so you will need to take another taxi to get there. Count on an extra $25 – $40 depending on traffic. Traveling by train is also an option. The route takes approximately one hour and 45 minutes, but delays are possible! Two trips each way are available per day, so make sure you don’t miss the last one. Amtrak offers online tickets starting at $44 round trip or you can buy them directly at the station. 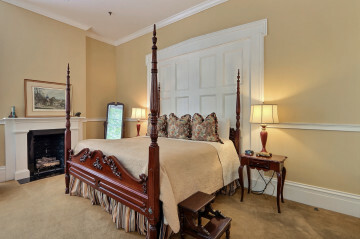 After having a fun day trip to Charleston, come back to a comfortable room at Presidents’ Quarters Inn. Our exquisite accommodations are exactly what you are looking for this season. Whether you are traveling alone or with your significant other, our splendid inn is sure to satisfy you. Book our James Monroe Room! This stunning and spacious suite is one of the innkeeper’s favorites. Relax with a hot shower in your private bathroom, then unwind at the desk area and write down all you saw that day. Get a good night’s sleep in the luxurious four-poster king bed and wake up the next day to the smell of coffee brewing. Be sure to join us downstairs where a delicious homemade breakfast awaits! Book your stay today at Presidents’ Quarters Inn! We are looking forward to hosting you.